Indian Army Recruitment 2019 - Apply Online for 130th Technical Graduate Course 2019 - 40 Vacancy in Indian Army. 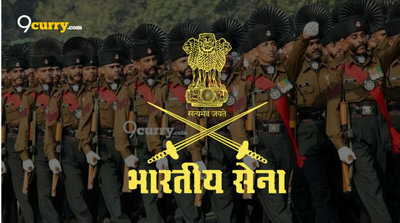 Online Applications are invited by Indian Army from 10 Apr 2019 to 09 May 2019 for 40 vacancies. 20 to 27 years as on 01 Jan 2020. Candidates should passed the requisite Engineering Degree course or in the final year of Engineering Degree course. The selection will be on the basis of SSB Interview, Physical & Medical Test. Eligible candidates may apply online at Indian Army's website (direct link is given below) from 10 Apr 2019 to 09 May 2019. Candidates log on to http://www.joinindianarmy.nic.in/. Click on “Registration", if you are a new user. HQ Northern Command Recruitment 2019 - Job notification for 71 Sub Area: 40 Civilian Motor Driver, Vehicle Mechanic & Other Posts in HQ Northern Command, Punjab. Applications are invited by HQ Northern Command, Indian Army on or before 23 Mar 2019 for 40 vacancies. Srinagar Army Recruitment Rally 2019 - Apply Online for Srinagar Army Recruitment Rally 2019 for eligible candidates of districts, Leh and Kargil. Online Applications are invited by Indian Army from 21 Apr 2019 to 04 Jun 2019 for the Army Recruitment Rally to be held from 20 Jun 2019 to 22 Jun 2019 at Army Helipad Ground, Kargil. Army Recruitment Rally Karnataka from 28 May 2019 to 06 Jun 2019 - Apply Online for Army Recruitment Rally Karnataka 2019 in Indian Army, Across India on Direct Recruitment. Online Applications are invited by Indian Army from 16 Apr 2019 to 15 May 2019 for eligible candidates of 11 districts Bagalkot, Vijayapura, Dharwad, Uttar Kannada, Dakshina Kannada, Udupi, Davanagere, Gadag, Haveri, Chikmagalur and Shivamogga For the Post of Soldier General Duty, Soldier Technical, Soldier Nursing Assistant, Soldier Tradesman, Soldier Clerk /Store Keeper Technical and Rally will be held from 28 May 2019 to 06 Jun 2019 at District Sports Stadium, Gadag (Karnataka). Neyveli Army Recruitment Rally from 07 Jun 2019 to 17 Jun 2019 - Apply Online in Indian Army, Across India on Direct Recruitment. Online Applications are invited by Indian Army from 09 Apr 2019 to 18 May 2019 for eligible candidates into the Army from seven districts of Tamilnadu viz Cuddalore, Vellore, Thiruvannamalai, Chennai, Tiruvallur, Villupuram, Kancheepuram and Puducherry dist of Puducherry (UT) in Soldier Technical, Soldier Technical (Aviation/Ammunition Examiner), Soldier Nursing Assistant, Soldier Clerk and Store Keeper Technical, Soldier General Duty and Soldier Tradesman categories and Rally will be held from 07 Jun 2019 to 17 Jun 2019 at Bharathi Stadium, Neyveli (TN). Jodhpur Army Recruitment Rally 2019 - Online Applications are invited by Indian Army from 06 April to 20 May 2019 for candidates of Banner, Banswara, Jaisalmer, Jalore, Jodhpur, Dungarpur, Pali, Pratapgarh, Sirohi and Udaipur districts for Sol GD, Sol Tech, Sol NAINA (Vet), Sol Clk/SKT/IM and Sol Tdn from 01 Jul 19 to 10 Jul 19 at Rajkiya Sharirik Shiksha Mahavidhyalaya, Jodhpur (Rajasthan). Gates will open at 0200 hrs and will be closed by 06:30 hrs on each day.